Stay tuned for more on the mid-season MLB All-Star Game in July, with the regular season wrapping up several months later as the Boys of October take to the field for this year's World Series. Major League Baseball - The Official Site - Like it says, with all the latest news, scores & complete schedules for National and American league games, official rules & regulations, related feature stories, interviews and video clips, photo galleries, fantasy baseball games, online store. Baseball Almanac - The Official Baseball History Site - Everything you ever wanted to know with a virtual encyclopedia of facts & trivia on historic World Series, opening days, players, famous firsts, and related information on baseball cards, lists of baseball movies, related songs, stories & poetry. 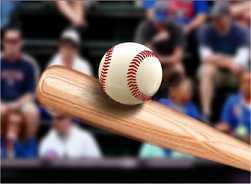 Baseball-Reference.com - Another great arbiter of bar-room bets, offering baseball stats, history and player profiles, team and league info and enough trivia to satisfy even the most rabid baseball fan. Baseball Hall of Fame - Visitor info, history and trivia, online exhibits, pictures, events calendar, and complete information on the annual Hall of Fame Induction Weekend held in Cooperstown in July.